I'd recommend cleaning the barrel if possible. As Doc Sharptail has mentioned, it will increase your accuracy once you get the gunk out of the rifling. 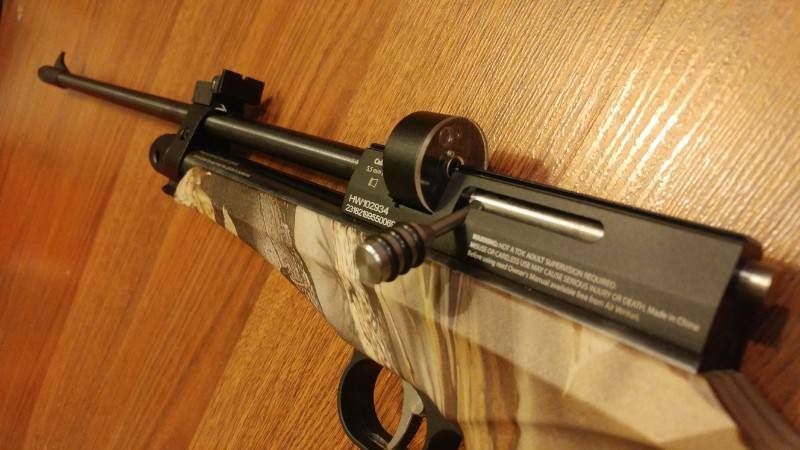 After sighted in the new scope for my HW35 , I started to work on the new rear sight that just came in the mail box today for the Chaser barrel band. A very tight fit that needed a little tapping using the screw driver handle, it didn't cause me much effort to put on the sight. It just works so well now with the long barrel and the shoulder stock. I also put on the multi shots (7 shots) mag. Runs good too!! Oh, yeah, I also used 6 or 7 cleaning pellets to push through the barrel to clean it. The first one and the 3rd one were soaked with 2, 3 drops of 30ND oil, the others were just dry cleaning pellets... And the used cleaning pellets told me this is really necessary.... As the dirty pellets are look dark brown color which I doubt some rust inside the barrel?! Or just the dried out factory ludes? Yep sir, a friend of mine has about the same gun. He bought it, although he is not into airguns, because of me, lol! Anyway, I cleaned it myself and adjusted the trigger so that it is now a single-stage. It is a precise gun but we never did use the magazines. I dunno but I have an aversion to them, preferring to load 1 pellet at a time. How about shooting it bereft of a band? Ar.... Never tried that, but I think if you use the long barrel, the barrel band is a must... It's not like the Crosman steel breech and long barrel which actually the barrel is set about 3 or 4 inches into the breech. Oh, I used my own stash of JSB 8g pellets when we tested his and it grouped very decently. The trigger on this pistol has very sharp corners though so I just slipped some small o-rings around it. It was several months ago and now he has sold it to another friend of ours.